A computer, running Windows, Linux, or Mac OS X (10.6.8 thru 10.14.x, and beyond). The KeyMusician Keyboard application, which turns your computer into a musical instrument with performance quality sound, giving you 7 octaves (like an 84 key piano), but playing many other instruments-sounds as well. Like an Accordion, it can play chords simultaneously with the melody, but can use hundreds of instrument-sounds. Video Lessons, Tutorials, and lesson materials, for learning to play music, and the instrument, as well as the KeyMusician Songbook, containing a variety of music designed to help you learn to play the instrument. This includes pieces to let you show-off your new musical abilities in a performance or a recital. Detailed instructions on installing the application. Step-by-step, detailed instructions, on how to improve your system, taking advantage of the music software available on each operating system. 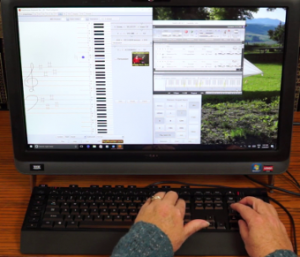 A newsletter with interesting articles, and tips & tricks of using the KeyMusician Keyboard. If you do not have the ability to play chords+melody music within 30 days, use our 100% money-back, no hassle guarantee, for a prompt refund. Many people have found that they can play music in hours, not days. The learning curve is a lot shorter. But do realize, that this is not ‘automatic’ and that effort on your part is needed. Developing reflex memory comes with practice. Click below to purchase it on our secure server, and begin your new musical adventure! Be sure to check your spam folder, in case the e-mails ended up there. “KeyMusician™”,” Making Music Yours™”, and “Turning Your Computer Into a Quality Musical Instrument” ™ and © copyright 2014 Laeramin LLC.